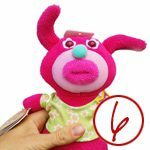 Looking for unique gift ideas for the special 2 and 3 year olds in your life? Here are my top picks for this Christmas! 1. 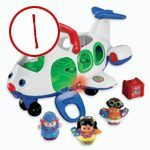 You little pilot will love this “Little People” airplane and 3 people. Push down on the pilot in her seat for flashing lights, a tune, flight attendant commentary, and swooshing airplane sounds. 2. 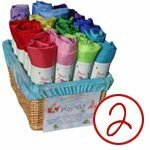 Encourage imaginative play with Sarah’s Play Silks. Dress up, build a fort, swaddle a baby, whatever their heart desires. Fans of the Waldorf approach to parenting and education know this is a must-have toy! 3. Inspire a lifelong love of music with this wooden musical instruments set. 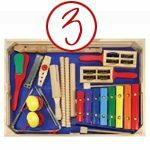 For individual or group play, this set includes a recorder, harmonica, metal triangle, jingle stick, castanets and more! 4. 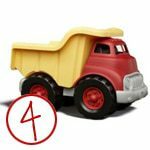 Get your little one working as they find things to haul and dump in this sturdy truck made from 100% recycled (BPA- and phthalates-free) plastic. This truck has a cool design and a working dumper. 5. 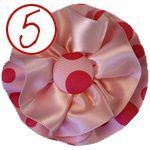 With everything from hair clips to adorable headbands, Kelly Joy Designs offers bright and colorful hair accessories that make the perfect accessory to holiday photos and outfits or fun stocking stuffers for your little girl. 6. I’ve never been one to buy the “hottest” toys of the season, but these Sing-a-Ma-Jig dolls are too cute. They chatter, sing and even harmonize with each other and are sure to make everyone laugh! 7. 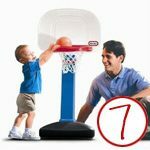 This basketball set grows with your toddlers by adjusting to six heights from 2 1/2 to 4 feet, and will provide years of entertainment and exercise for your kids. It’s oversized rim and a junior size basketball are perfect for your little team. 8. 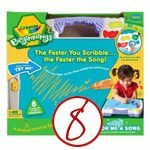 Your toddler can create music with their scribbles with this fun art desk. They’ll learn about tempo and instruments and discover the joy of composing their own unique songs! 9. 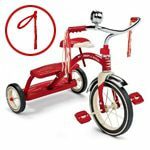 The kids will love this retro tricycle that has chrome handlebars, fender and a bell that rings. It also has an adjustable seat so it will grow with your child.